An early return to running. I'm writing this while tucking into porridge with blueberries. Fantastic! Anyway! I haven't ran for over a week due to a pain in my back. I was booked in for a massage on Wednesday to put it right but had to cancel due to a random headache! Strangely enough, a few people I know came down with the same headache symptoms so it must have been some bug or other. I've rearranged the back massage for Wednesday next week. In the meantime, however, I'll be back on the streets this morning for the 10.5 mile Peter's Pies 6 Tyne Bridges Challenge. It'll be a case of taking it very steady in order to protect my back. It's important that I get myself fit for next Sunday when I start 7 days of 13 miles per day. This, of course, is part of my gradual build up to 7 days of 32 miles a day by mid August. For now, though, I turn my immediate attention to getting around the roads and paths of the River Tyne. A pain in the back! I gave Beach Bootcamp everything I had last Saturday but unfortunately aggravated my back during one of the sprint drills. Somehow, I made it to the gym afterwards for a 3 x 3 mile session on the treadmill with a mile on the cross trainer in between. This is a kind of session I'd only just tried the night before for the first time. I'd forgotten my iPod and needed a different approach to avoid the boredom. The idea here is to get the 3 miles on the treadmill done as quick as possible then the same with the mile on the cross trainer. The next 3 miles on the treadmill must be done quicker than the last 3 and so on. On Friday night I managed a quicker 3 miles each time and left the session with a good calorie burn and more importantly a bit of confidence to take into the weekend. Saturday morning's 3 x 3 was a lot different to the previous session. I managed the first 3 miles at a 10 minute mile pace. I just couldn't go any quicker. As soon as I tried to increase the speed in the treadmill the pain in my back became unbearable. When I started the 2nd 3 mile session the pain became unbearable at 11 minute miles. Enough was enough and I decided to call it a day. "Listen to your body" and all that. Unfortunately, the pain lasted all weekend and I had to duck out Sunday's 10.5 mile Peter's Pies 6 Tyne Bridges Challenge. The pain was at it's worst this morning (Monday) and by mid afternoon the pain had left my back and ventured into my hamstrings via my glutes. Nice! As I write this blog post this evening, the pain is far more bearable and I hope to be running again by Thursday at the latest. Sunday 7th February - 10.5 mile run, The Peter's Pies 6 Tyne Bridges Challenge. (01:39:06). Monday 8th February - 6.25 mile run, Jesmond Dene. (01:01:28). Monday 8th February - 3.75 mile run, Treadmill. (00:39:02). Tuesday 9th February - 10.3 mile run, Gosforth to Rowlands Gill. (01:52:50). Wednesday 10th February - 5.2 mile run, Heaton to Dave Fairlamb's Gym. (00:53:29). Wednesday 10th February - Personal Training Session. (01:30:00). Wednesday 10th February - 5.2 mile run, Dave Fairlamb's Gym to Heaton. (00:57:48). Thursday 11th February - 10 mile run, Treadmill. (01:45:10). Friday 12th February - 10 mile run, Treadmill. (01:47:20). Saturday 13th February - David Fairlamb's Beach Bootcamp. 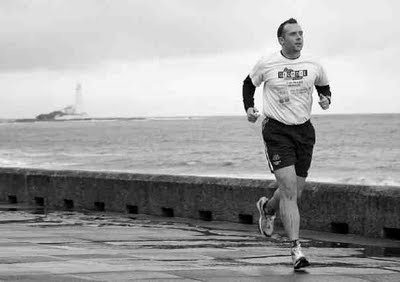 Saturday 13th February - 5.1 mile run, Tynemouth, Fish Quay, Pier. (01:00:56). Saturday 13th February - 5 mile run, Shotley Bridge to Ebchester and back. (00:48:59). Well it's not that often that I ache after a run these days but last night's efforts seemed to have taken their toll on my legs when I woke up this morning. It's not a bad thing when it happens. In fact, I always look forward to seeing how I react on the next scheduled run. On top of the soreness was a wave of tiredness. What a state after 10 miles and 1 gym session! Today's 10 miles were done on the treadmill in the gym and the first 5 miles were such a struggle. I couldn't get the pace above 11 minute miles. Very poor! At that point I was thinking that I still had quite a few miles to do this week and how more difficult it was probably going to get. Just then, colleague Fraser Scott (aka Crazy Trev) joined me on the adjacent treadmill. Off came my iPod and after a bit of banter (and only 5 miles left to do) I felt a whole lot better and stronger. I finished the last mile at 07:40 per mile pace and I've got to say that I felt absolutely brilliant. It was a total contrast to when I'd started the run. Anyway! That's 50 miles for the week done and 20 left to do. Surely it's in the bag now! Things are going very much to plan so far in week 67. This week's target is 10 miles a day for 7 days. It's an amount of miles I'm well capable of achieving and is very much the first stepping stone to the ultimate target of 32 miles a day for 7 days in August. My training week started with the 10.5 mile Peter's Pies 6 Tyne Bridges Challenge on Sunday. On Monday I ran up a few climbs in Jesmond Dene and followed that up with a session on the treadmill. Yesterday's run was 10.3 miles from Gosforth to Rowlands Gill. Katy was there to pick me up at the end (as she's done quite a lot lately). The first run today was 5.2 miles from Heaton to David Fairlamb's gym in Tynemouth. I then had my usual 90 minute personal training session with Mark Fleming before running the 5.2 miles back to my car in Heaton. No problems there at all. I've got to say that I'm pleased and quite surprised at how quick my fitness has come back after 4 weeks off with that chest infection.Confidence continues to return more and more each day too. I've got 3 more days of 10 mile runs this week and I'm on target to get about 72 miles done this week as well as David Fairlamb's Beach Bootcamp. Everything has been setup this week to achieve the mileage. i.e. working slightly fewer hours, doing less school runs and Katy has been on hand to pick me up when required. All the lessons learned last year have been put into practice this week and so far it's paying off. Next week I've only got 50 miles to run to it's my turn to do more school runs and I'll be making up those lost hours at work. At long last I seem to have found a good work/life/training balance. Maintaining this balance will be absolutely vital in the coming months. The Run Geordie Run T-shirts are continuing to sell really well in aid of St Benedict's Hospice (Charity No. 1019410) and The Children's Foundation (Charity No. 1000013). Not only are they selling well but they are continuing to reach the four corners of the planet! Over £2300 has been raised so far as a result of t-shirt sales and this has helped the overall charity fund reach the current total of £5,927. 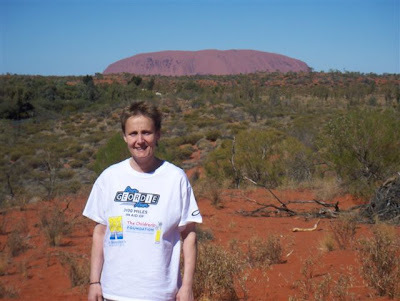 Each Run Geordie Run T-Shirt, modelled here by Marie Hudson on tour down under, is priced at £10 each. The amazing thing is that the full £10 goes to the charities. Yes, that's right! Amazing, I know! You pay £10 per t-shirt and all of it goes to the 2 charities. This is the way we like to do our fundraising at Run Geordie Run! Production for each t-shirt was kindly paid for by nufc.com reader Peter McCowie and made, at cost price, by my friends at www.customplanet.co.uk. They are screen printed, front and back, for durable and long term use. Current sizes available are S, M, L,XL and XXL. If you would like a t-shirt then please click here to be taken to the order form. Finally, thanks to Marie for taking time out to send this photo while on holiday in Australia. I'm 4 weeks into my revised training schedule and things have gone very well so far. The chest infection of December 2009 is a dim and distant memory and I'm working very hard to get to a level that will bring success in the USA next year. The new training schedule took a few weeks to compile and was drawn up with all of the lessons I learned last year in mind. There is a heavy focus on running high mileage on consecutive days. The ultimate aim in this phase of training is to recreate one of the weeks in the USA. I'm scheduled to achieve that by mid August. That's 7 days of 32 miles a day to be exact. Being able to run that kind of consecutive daily mileage doesn't happen overnight and the build up to that really starts this week. Today, I ran the Peter's Pies 6 Tyne Bridges Challenge to give me 10.5 miles. I'll be running 10 miles a day for the next 6 days to give 7 consecutive days of at least 10 miles a day. Training for the the 3 weeks following that is varied and will see me in the gym as well as getting some hills in and some speed work too. In 4 weeks time I will be doing another 7 consecutive days of running. This time the daily mileage will be 13 miles. That will be followed by 3 varied weeks and on the 4th week it will be another 7 consecutive days of running. And so on and so forth. The key to this schedule is the big consecutive mileage every 4th week. I'm calling them my "red weeks" as that's what colour they are highlighted in on my spreadsheet. In theory, I should be doing less hours at work on a red week. I will also be doing very few school runs on a red week. The other varied weeks, which are green and yellow incidentally, are also designed for consecutive mileage but over fewer days. These weeks are still tough but I should have more time for family, work etc. 07/02/10 - 7 days of 10 miles a day. 07/03/10 - 7 days of 13 miles a day. 04/04/10 - 7 days of 16 miles a day. 02/05/10 - 7 days of 19 miles a day. 30/05/10 - 7 days of 22 miles a day. 27/06/10 - 7 days of 25 miles a day. 25/07/10 - 7 days of 28 miles a day. 22/08/10 - 7 days of 32 miles a day. I'm currently on the 2nd day of a red week and feeling very good. My confidence has increased considerably over the last 4 weeks and it's a great start to 2010. Sunday 31st January - 10.5 mile run, The Peter's Pies 6 Tyne Bridges Challenge. (01:49:03). Monday 1st February - 5 mile run, Race Course. (00:49:33). Monday 1st February - 5 mile run, Treadmill. (00:56:04). Wednesday 3rd February - Personal Training Session. (01:30:00). Wednesday 3rd February - 8.5 mile run, Dave Fairlamb's Gym to Gosforth(01:27:57). Thursday 4th February - 6 mile run, Town Moor. (00:58:27). Friday 5th February - 3 mile run, Treadmill. (00:29:18). Saturday 6th February - David Fairlamb's Beach Bootcamp. (00:45:00). Saturday 6th February - 10.5 mile run, Tynemouth to The Baltic. (01:46:31). I've had a few bits of good news this week. The first was when local running shop, Northern Runner got in touch saying that they'd like to sponsor www.rungeordierun.com for another year. 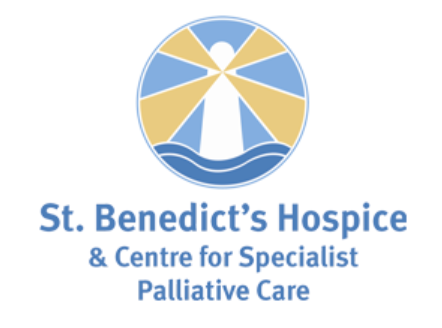 Of course, it goes without saying that all sponsor money is split between St Benedict's Hospice and The Children's Foundation. My association with Northern Runner goes back quite a few years now. I've bought shoes and clothing from there for many of my major runs. It was actually John Lavender, one of the staff, who put me on to Brooks shoes back in 2007 a few months before I ran 874 miles from John O'Groats to Lands End. The rest, as they say, is history and those shoes saw me safely to Lands End while the run raised £34,108 for St Benedict's Hospice. So I'd like to give a sincere thanks to Northern Runner for their continued support of this website and more importantly of the 2 charities I'm raising funds for. From my own experiences over the years, I would recommend them to anyone who is looking for new shoes or clothing. The shop is located on Low Friar Street in Newcastle just down from The Gate complex. Don't forget to tell them I sent you! Sunday 24th January - 10.5 mile run, The Peter's Pies 6 Tyne Bridges Challenge. (01:43:49). Wednesday 27th January - Personal Training Session. (01:30:00). Saturday 30th January - 7 mile run, Rowlands Gill to Shotley Bridge. (01:04:26).